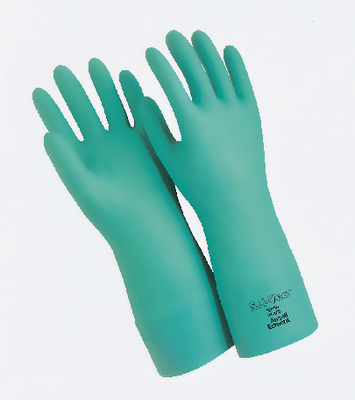 Chemical-resistant gloves are suitable for chemical processing, food processing, aerospace and automotive degreasing, general manufacturing, electronics, and other applications. Tough nitrile compound provides long wear and good protection against abrasion, cuts, snags, and punctures. Strong resistance to degradation ensures that gloves will not weaken or swell. Optional cotton flock lining absorbs perspiration and makes donning and doffing easier. Gloves are free of protein allergens and will not promote contact dermatitis. Protects against a wide range of chemicals, including aromatic solvents, cutting oils and coolants, petroleum solvents and animal fats. Certifications: Component materials comply with FDA food handling requirements (21 CFR 177.2600).